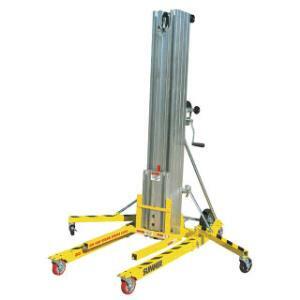 The Sumner 2020 lift is capable of lifting a 800 lb load to a height of 20'. The short mast sections alllow the lift to travel through doorways without tipping and can fit into the back of most pickup trucks. The forks on the unit are reversible, and has outriggers for extra support. The stowed height is 6' 3", the length is 2' 8", and the base width is 2' 6". The machine weighs 390 lbs. * Please call us for any questions on our lift material 20 foot 800lbs. rentals in Hillsdale and Ridgewood NJ.